An employee's-eye view of what makes a great boss and how you can become one Whereas most books on managing people approach the subject from the perspective of a manager of an idealised organisation, Becoming a Better Boss takes a real-world approach, looking at the topic from the perspective of an employee in a real-world organisation dysfunctions, warts, and all. Focusing on the choices individual employees make every day in getting work done, this book reinvents the practice of management one employee at a time. 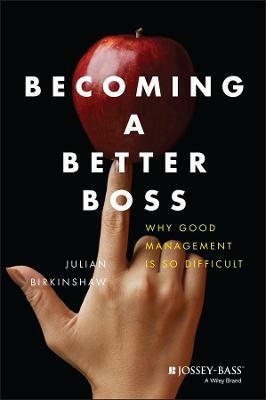 Author Julian Birkinshaw stresses the importance of taking management seriously, reveals where management practice often goes wrong, and dives deeply into the worldview of employees. He then explores the common personal biases and frailties of managers and discusses the vital importance of experimentation to overcome the limitations and idiosyncrasies of a particular organisation. Throughout, he supports his assertions with case studies from a wide and varying range of management experiments and situations at real companies. * Written by a leading authority on strategy, management, and innovation who is also the author of eleven books, including Reinventing Management * Introduces a new approach to management focused on real employees and actual situations * Includes case studies from real organisations Between the stress of deadlines and the demands of today's business environment, it's easy for managers to lose sight of the importance of people management. Becoming a Better Boss not only shows managers how to lead effectively, but why doing so is vitally important to every organisation's success. THIS IS NOT JUST ANOTHER BOOK ABOUT WHAT MAKES AN EFFECTIVE MANAGER. Becoming a Better Boss highlights why well-known advice on good management is so rarely heeded. By focusing on management through the eyes of an employee, Julian Birkinshaw gives us insightful and helpful advice on what we might do differently - both as individual managers of others, and as architects of the organizations in which we work. To achieve this, the author has spent time working "in the trenches" to remind himself what life as an employee feels like, as well as interviewing hundreds of employees and managers and undertaking surveys which have received responses in the thousands. The resulting book is a radical new look at what makes good management which is applicable to both manager and employee. It takes managers out of their comfort zone and shows how you can do things differently. It shows how the employee can help themselves be managed more effectively and explores the limitations and pathologies of the organizations we work for. "We know the secret of long term success is more engaged employees. In this book Julian Birkinshaw shows how managers can do a much better job of fully engaging the people around them, so they can do their best work." DAVID MACLEOD, AUTHOR OF THE MACLEOD REPORT TO THE UK GOVERNMENT, "ENGAGING FOR SUCCESS"
Julian Birkinshaw is Professor and Chair of Strategy and Entrepreneurship at the London Business School. He has PhD and MBA degrees in Business from the Richard Ivey School of Business, University of Western Ontario, and a BSc (Hons) from the University of Durham. He was awarded an Honorary Doctorate by the Stockholm School of Economics, 2009. Professor Birkinshaw s main area of expertise is in the strategy and management of large multinational corporations, and on such specific issues as corporate entrepreneurship, innovation, subsidiary headquarters relationship, knowledge management, network organizations, and global customer management. He is the author of eleven other books, including Reinventing Management: Smarter Choices for Getting Work Done (Revised and Updated Edition 2012), Giant Steps in Management (2007), Inventuring: Why Big Companies Must Think Small (2003), Leadership the Sven-Goran Eriksson Way (2002) and Entrepreneurship in the Global Firm (2001), and over seventy articles in such journals as Harvard Business Review, Sloan Management Review, Strategy Management Journal and Academy of Management Journal. He is active as a consultant and executive educator to many large companies, including Rio Tinto, SAP, GSK, ABB, Ericsson, Kone, Petrofac, WPP, Bombardier, Sara Lee, HSBC, Akzo Nobel, Roche, Thyssen Krupp, UBS, PWC, Coloplast, BBC, Unilever and Novo Nordisk. In 1998 the leading British Management magazine Management Today profiled Professor Birkinshaw as one of six of the Next Generation of Management Gurus . He is regularly quoted in international media outlets, including CNN, BBC, The Economist, the Wall Street Journal, and The Times. He speaks regularly at business conferences in the UK, Europe, North America and Australia. Professor Birkinshaw is co-founder with best-selling author Gary Hamel of the Management Innovation Lab (MLab), a unique partnership between academia and business that is seeking to accelerate the evolution of management.